Grease interceptor maintenance and service are two key components to keep your interceptor up and running efficiently. Looking after and maintaining an interceptor based on the local ordinance and manufactures recommendation makes sure you stay in compliance with local regulations and out of any trouble. The goal of keeping fats, oils, and grease out of the public sewer benefits everyone involved, reducing costly back-ups, and keeping the environment clean from hazardous waste. Grease Guardian maintenance steps can be easily and sanitarily performed by any member of the kitchen staff. In less than 5 minutes you perform all the necessary steps to ensure your equipment can maximize its performance and protect against fats, oils, and grease in the waste water. from any incidental solids that end up in the waste stream during the washing process of your kitchens pots and pans. NO solids strainer is designed to be a garbage disposal, practice good kitchen habits and scrap your plates prior to washing. Remove the front torpedo cover exposing the strainer basket handle. Strategically positioned above the water line, your solids have the chance to drip dry. Remove the strainer basket and empty the contents into the proper waste bin. Return the strainer and cover. Emptying the Grease Collection Container – After each scheduled skimming cycle you will see the grease that has been removed. 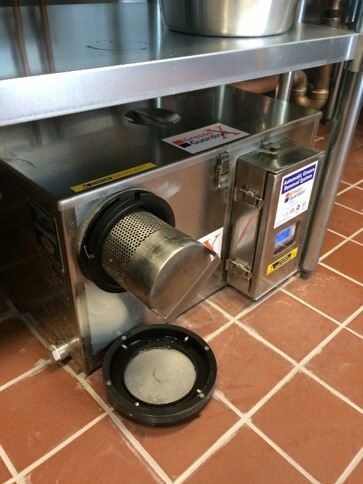 Located on the right side of the Grease Guardian, slide and remove the grease collector. Empty its contents into the designated waste bin. Remove and Clean the Skimming Blade – Before returning the grease collection container, remove and wipe down the skimming blade. The blade will be exposed once you remove the Grease Guardian stainless steel hood. Once you have completed these tasks, properly position the wiper blade back in place and return the hood and grease collector. Your machine has now been properly maintained and is ready for its next scheduled skimming cycle! Call today for more information about our grease removal equipment and for assistance with properly sizing equipment.